Note: This is NOT a Z-Wave device however it can be integrated with the Fibaro system. 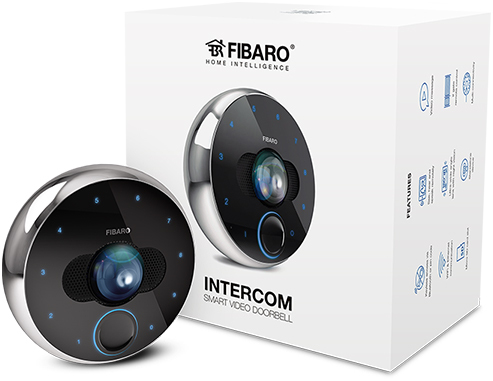 The Fibaro Intercom allows you to take calls from visitors at your door even when you are not at home. The Fibaro Intercom also includes two relay outputs allowing you to control two electrical doors/gates. This can either be done by using the unique PIN input or using our phone with BlueTooth proximity. You can even access them remotely using your mobile app to allow an unexpected visitor in when you are not home. NOTE: This is not a Z-Wave device. The device may be connected to network via Ethernet (recommended) and Wi-Fi. NOTE: To run the Fibaro Intercom you need a iOS mobile device connected to the Wi-Fi, FIBARO Intercom App, FIBARO ID account (which you can set up during the configuration process). The Fibaro Intercom also comes with a built in-tamper detector and can be integrated with your home security system, providing not just comfort but also safety for you and your family.